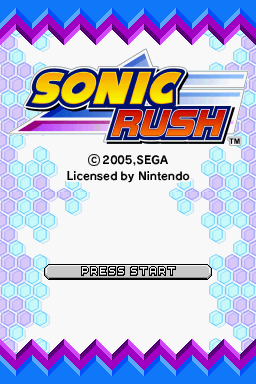 The Sonic Rush E3 beta for the Nintendo DS is a one-level demo of Sonic Rush, displayed during E3 2005. It was found by drx, paid for by Techokami, and was then sent to Lightning to be dumped. It was then released on drx's website Hidden Palace as their first DS release. Only one zone is playable by default, but by examining the games contents it is found that there are seven zones partially programmed into the ROM, but only two extra levels are playable. That would be Zone 2 (Act 1), and Zone 7 (Act 1). The title screen is different and features spikes that scroll across the top of the screen. In the final the entire screen scrolls. The boost works differently, you are able to boost from anywhere, even mid-air. The boost meter also refills itself automatically, but slowly. The music is different from final and Act 1's theme is an alternate version of "Blaze Appears." The boss dies in 4 hits and there's no remarks from Eggman at all. An entire Sonic Advance 3 sprite set was was found in the ROM, indicating the game may have used Sonic's previous GBA sprites for a time while in development. The voice work of Ryan Drummond is used instead of Jason Griffith. The E3 ROM uses a single .sdat for the music, while in the final, multiple .sdat files were used. The beta results screen. Sonic is off-center and the Sonic Advance 3 font is used for the numbers. Sonic Advance 3 sprite lined up. This page was last edited on 15 April 2018, at 13:04.